To try and strengthen Di Sabatino’s assertions, the movie questions Larry’s claim that he quit the band over religious differences and Capitol Records’ decision to call the People album “I Love You.” Di Sabatino quotes a member of People! saying that Larry was very “secretive” about his religious beliefs, while another says he is not sure how committed Larry was as a Christian. This is all part of an attempt to frame Larry as someone who told untruths from the very beginning of his career. Larry wanted nothing to do with Scientology. He stopped hanging around with the other members in their off time, and he especially didn’t like the direction they were now trying to take the group. The majority of the band wanted to spread the message of Scientology, and Larry was opposed to it. The local Scientology HQ apparently labeled Larry a “Suppressive Person” because he didn’t follow his band-mates into the organization, and soon allegedly began harrassing him frequently by phone — apparently a typical Scientology ploy. Eventually, according to Norman, the band’s manager Mikel Hunter (aka Captain Mikey) somehow convinced the powers that be at Scientology to stop harrassing Larry. 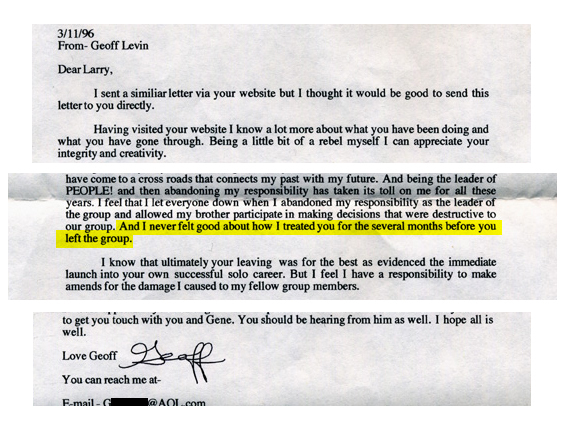 In a letter to his father, (click for PDF or JPEG) Larry expressed his relief that the harrassment had stopped. 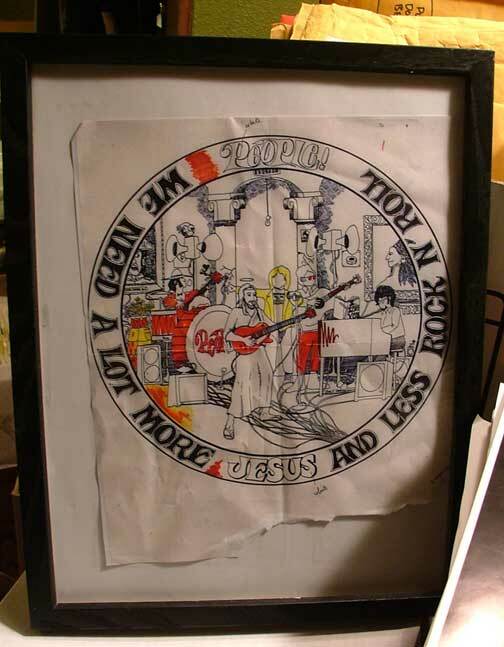 But when the album artwork and title was changed at the last minute by the record company to “I Love You,” a band meeting was held in which Larry announced that he wanted to quit the band because of the influences of Scientology. 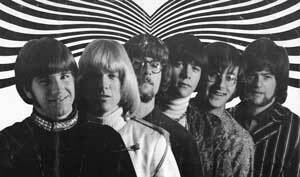 The band’s founders called him delusional and preempted Larry’s resignation by firing him on the spot. The band then immersed themselves completely in Scientology and continued on without Larry. Although Larry was no longer in People, the band still used several of his songs on their next record. 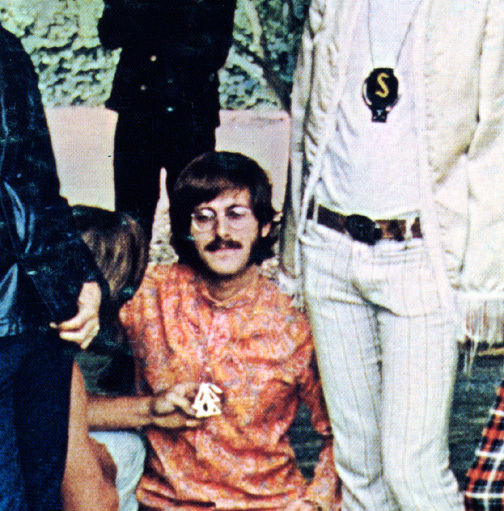 On the album’s cover, two of the members of People are pictured wearing huge Scientology medallions around their necks. 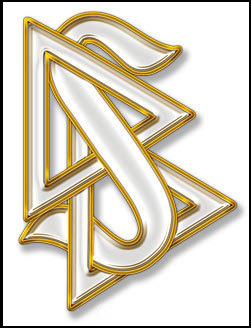 Here are photos of the Scientology symbol, the next People album cover and a closeup of the medallions worn by the band members. To this day, two of the ex-People members are still heavily involved in Scientology: Al Ribisi and Geoff Levin (who appears in the movie and calls Larry “delusional.”) Click on their names for links to their Scientology records. This, incidentally, is the same broken finger that Larry began pointing skyward as a sacrifice to The Lord during his solo concerts. When audience members would applaud his songs, Larry would lift his finger and point at The Heavens to The One that really deserved their enthusiasm. Audiences soon began pointing skyward as well. This was the origin of the famous “One Way” symbol. Read more about it on the MISC. RUMORS page of this web site. “While I was in high school and I believe in my junior year, ~1963-64, I started playing music with Larry and we rehearsed at his parents’ house. We spent time rehearsing but we also spent time together just as friends. During that period Larry told me that he was a Christian. The subject came up in the context of musical subject matter. Larry wanted to keep the music wholesome. Then when we became roommates just before we joined People, he told me about Jesus and what He could mean to me in my life. Shortly after, he and I joined People together as a lead-singing duo. During that period, he mentioned to me that he was conflicted about some of the subject matter in the music that the band played. He loved the band and enjoyed performing very much, but I was always worried that he would leave the band due to this conflict. After People, in 1974, I joined his back-up band and during the course of that portion of our relationship, he brought me to the Lord. He was on fire for the Lord then as he was since the day I met him. 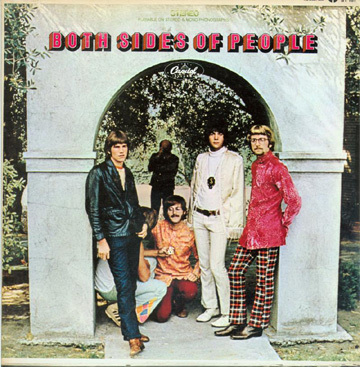 Some of the other band members in People were Jewish or non-believers and Larry felt that it was best to keep his religion at a low profile. Therefore I’m not surprised that some of the other band members were not aware of his faith. Other friends of Larry’s from the early to mid 1960s have chimed in recently. Here’s a letter from Coleen Morris which references Larry’s faith before 1965. Click for PDF file of her recent email. 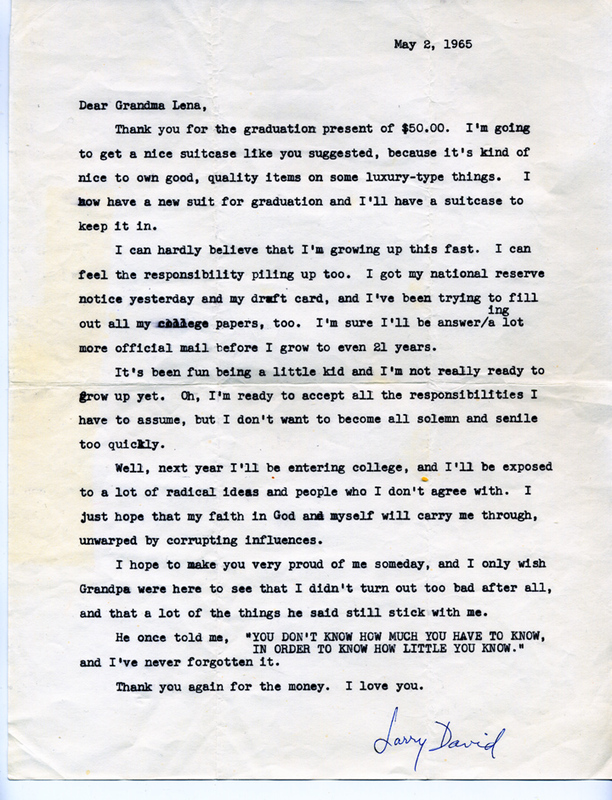 Coleen’s brother, Brad Harper, Professor of Theology at Multnomah University also added his recollections of Larry as a teenager in this letter posted here in PDF format. Several other untruths in the movie are predicated on the idea that Larry wasn’t a Christian until 1969. 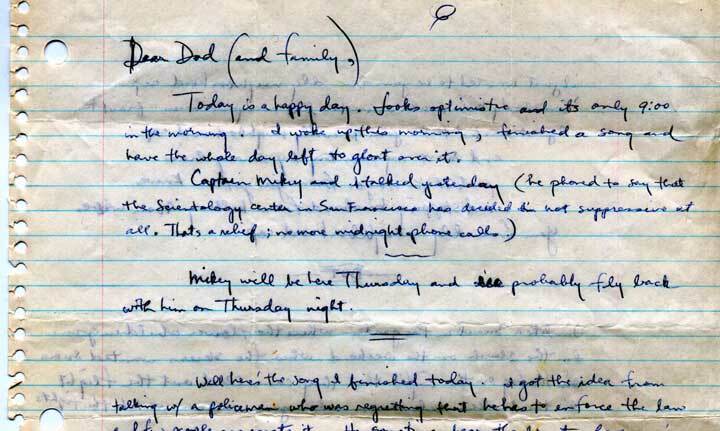 Here is a letter Larry wrote to his Grandmother in 1965. In it he says “… next year I’ll be entering college, and I’ll be exposed to a lot of radical ideas and people who I don’t agree with. I just hope that my faith in God and myself will carry me through, unwarped by corrupting influences.” Click for a PDF or JPEG of the letter. Finally Larry and his mother told me nearly identical stories about his decision to follow Jesus at the age of five.